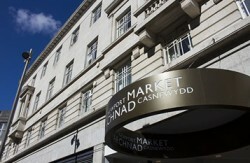 Our first location in Newport is based in The Business Loft, High Street, next to the new entrance of the Indoor Market. Coworking has never been more accessible for the Newport community, with affordable parking nearby, minutes away from the railway station, M4 and bus station. We’re in the heart of the city. Housing up to 40 coworkers, Newport Central is a great space for freelancers, micro-businesses and those graduates just embarking on the first steps of their solo career. Equipped with modern furniture, The Business Loft is an ideal place to work, in a vibrant and lively city. Just like all our other locations, Newport Central has endless tea and coffee, meeting spaces, a kitchen and toilets. Indycube Newport is open 9-5:00pm Monday to Friday.